Take a look at these two photos. Both are images of a DEVAUGHN plot at Felton Cemetery in Montezuma, Georgia. The first is a view of what I would consider the front, and the second from the back. The first wife, S. V. DeVaughn (1849-1882) is memorialized by the beautiful figure to the far right in the top photo. 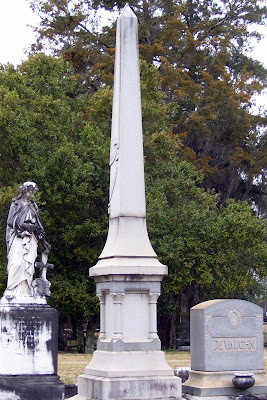 The husband James Elijah DeVaughn (1840-1908) is the obelisk in the center. 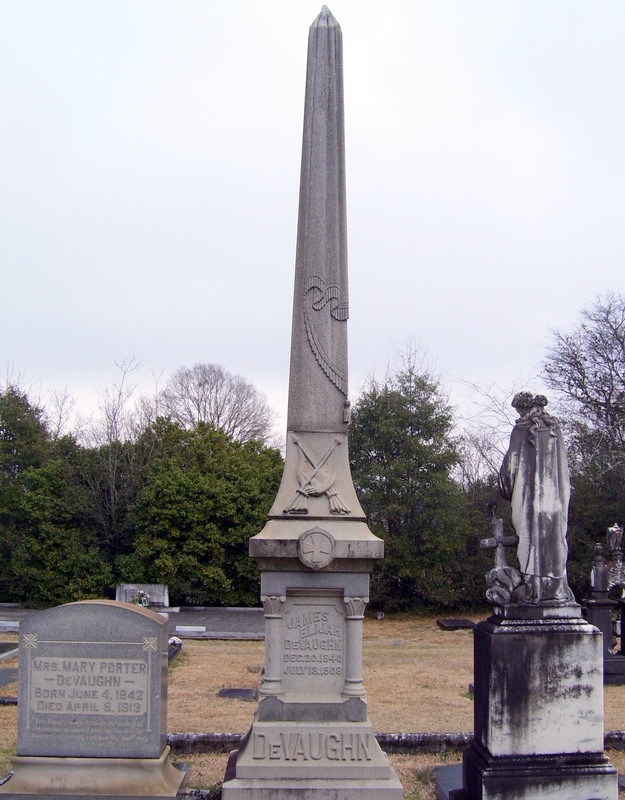 The second wife, Mrs. Mary Porter DeVaughn (1842-1913) is the granite marker to the left. It seems odd that the gravestone for the first wife is facing one direction, while the stones for the husband and second wife are facing the opposite. Of course, the second wife would have probably had input in the placement of the later. Should that give me a chuckle, or am I over analyzing? Hmmm. It does give you reason to pause and ponder. LOL, Greta! I'm too busy snapping pictures to notice too much when I'm actually in the cemetery. It's usually when I'm going back over items at home that my brain wanders! Interesting. I'd say the placement wasn't by chance but by design.